Exploring Space: star gazing or history making? During the Apollo lunar missions from 1968 to 1972, those on board were given 16mm cameras and told to film anything and everything they could, in space, in orbit, and on the surface of the moon itself. NASA was at the cutting edge of video camera technology during the Apollo missions and customized various types of cameras to capture the footage. Two decades later, filmmaker Al Reinert went into the NASA vaults to create this extraordinary compendium of their journeys and experiences. Assembled from hundreds of hours of the astronauts' own footage, with a soundtrack made up of their memories and a specially composed score by Brian Eno, the film takes the form of one journey to the moon and back again, building with elegant simplicity and exquisite construction to create an overpowering vision of human endeavour and experience. 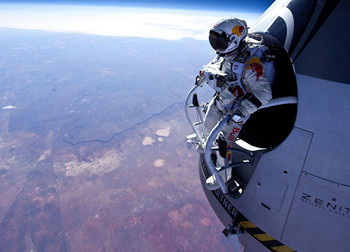 Felix Baumgartner has made history by smashing the world record for the highest free-fall jump from 128,097 ft – quite out of kilter with today's tendencies to be risk averse - as an example of pushing the boundaries in scientific experimentation in a near-space environment. Interviewed in 1999, the late Neil Armstrong expressed the significance of the 1969 Apollo 11 moon landing in terms of demonstrating 'that humanity is not forever chained to this planet, and our visions go rather further than that, and our opportunities are unlimited.’ While President Obama recently paid tribute to Armstrong's 'spirit of discovery', his belief in ‘unlimited opportunities’ runs counter to mainstream political thinking today - mostly premised upon the idea of an 'inconvenient truth' that there are natural limits which man cannot surpass. The excitement generated by Curiosity‘s trip to Mars suggests that our yearning to reach beyond the limits of the present persists. But, believing that resources are limited and humanity is no longer capable of unchaining itself from the planet, what does it mean to gaze at the stars today? Are we truly searching for new horizons or contemplating our own insignificance? The Manchester Salon is participating in the fabulous Manchester Science Festival for the third year running, where you can explore the wonder of science with nine days of events designed to highlight and explore the myriad ways that science touches our lives; enjoy beautiful installations, films on the big screen in a beautiful warehouse setting, immersive science experiences, intriguing evening events, inspiring talks and debates, hands-on workshops and more during 27 October - 4 November 2012. Manchester Science Festival is proudly produced by MOSI, see http://www.manchestersciencefestival.com for full details.